The Brick Industry Association honored 1225 Old Town with a 2013 Brick in Architecture Award program. The project received a Gold Award in the Multi-Family Residential category. 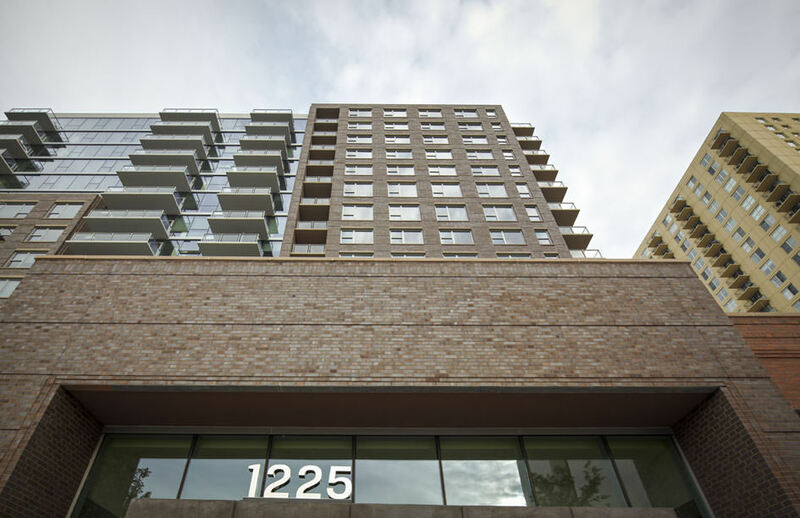 1225 Old Town is a LEED-Silver certified, mixed-use development on Wells Street in Chicago’s Old Town neighborhood. It features 250 luxury apartments, 35,000 SF of retail space, and structured parking for 258 vehicles. The building’s aesthetic design was inspired by the context of the infill site on a busy arterial street, and the architecture of the turn-of-the-century Victorian walk-ups that typify this traditional Chicago neighborhood. To break up the scale of the 360-foot-wide site, the building form is organized into two opaque masses that are separated by a glass connection. The façade is a modern treatment of traditional brick and glass materials. The tower is set back from the ground-level retail spaces to provide a pedestrian-friendly streetscape. Specifying brick as the primary façade material contextualized the building to have a relationship with the dominant building material used throughout Old Town. HPA incorporated a variety of masonry shapes, colors and patterns to create texture and visual interest. The building base utilizes smaller modular bricks while the tower section incorporates larger utility brick, which complement the scale of the building when viewed from a distance. Subtle recessed corners foster shadow lines that become more pronounced depending on sun’s angle. The result is a structure that is a distinctive property in the marketplace that anchors the neighborhood and respects and complements the existing architecture. Since 1989, the Brick Industry Association, a national trade organization that represents brick manufacturers and distributors, has sponsored the nation’s premiere architectural award featuring clay brick. Projects were submitted for consideration by architectural and design firms around the country. A national jury was comprised of peers, including: Allison Anderson, Unabridged Architecture; Phil Casey, CBT Architects; Jack Esterson, WASA/Studio A; Preston Gumberich, Robert A.M. Stern Architects LLP; Jeff Knopp, Behnke Associates; Marvin Malecha, College of Design, NC State University; Dave Otte, Holst Architecture; Eric Penney, Nagle Hartray Architecture; Bruce Schenk, Mark B. Thompson Associates; Vanessa Schutte, DLR Group; Donald Selander, Pedcor Design Group and Bruce Wood, Kallmann McKinnell & Wood Architects. For more information on the awards program and to learn more about 1225 Old Town, click here.